If you haven't had a chance to visit the new Haskell's Wine Bar on Nicollet Mall in Downtown Minneapolis, you might want to check out this feature from KSTP's Twin Cities Live. Elizabeth Ries describes the new wine bar as "a new, hidden gem" in Downtown Minneapolis, and Emily Engberg sat down with our very own Ted Farrell to explore some of the Wine Bar's offerings—from wine, cheese and much more! Are you a handy, do-it-yourself wine lover looking for something clever and interesting to do with all of those empty glass wine bottles? 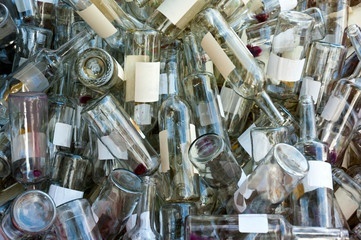 Rather than recycle your collection, consider upcycling them with some creative wine bottle crafts. We've had some fun with wine bottle DIY projects in the past with our Five Fun Wine Bottle Crafts to Make at Home, and decided to search for five more projects to add to your bucket list.